Nearly 19,000 people in Wales have had their Jobseeker's Allowance either stopped or suspended under rules to ensure they actively seek work. Since October 2012 claimants have faced the prospect of sanctions ranging from suspension of benefits to a three-year ban if they do not not look for work. The UK government says it wants to end "the something-for-nothing culture". The charity Oxfam criticised sanctions imposed for "mundane reasons" like missing appointments through illness. There are 69,400 Jobseeker's Allowance (JSA) claimants in Wales. Of those, 18,750 claimants - just over a quarter of the total - had their benefits payments suspended 26,510 times between October 2012 and June 2013. 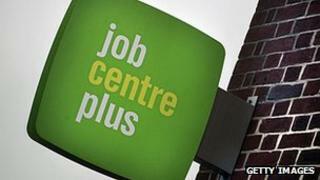 Across the UK, more than 400,000 people lost their JSA, as 580,000 sanctions were handed down. The latest figures were published by the Department for Work and Pensions. UK employment minister Esther McVey said: "This government has always been clear that in return for claiming unemployment benefits jobseekers have a responsibility to do everything they can to get back into work. "We are ending the something-for-nothing culture. "People who are in a job know that if they don't play by the rules or fail to turn up in the morning, there might be consequences, so it's only right that people on benefits should have similar responsibilities. "We always make the rules very clear. It's only right that there is a penalty if people fail to play by them." However, Julian Rosser, head of Oxfam Cymru, said: "Tougher rules on benefit sanctions have hit more people, leaving many without food and other necessities. "We have spoken to people who have had delays and sanctions for mundane reasons, such as not having the right ink to fill an application or missing appointments due to sickness which is unacceptable. "Any sanctions system needs to operate in a way that does not push people further into poverty. "People need support not punishment. They need understanding not condemnation." Across the UK, the figures showed 53% of decisions to withdraw benefit were the result of the lowest level sanction, while 38% were intermediate and 9% at the highest level. In total, 223,000 people have so far received the lowest sanction, 167,000 the intermediate suspension and 48,000 the highest.